Data is growing fast—nearly 90 percent of the world’s data was created in the last two years, and enterprise data is doubling every two years. Join Komprise & IBM to learn how modern enterprises are transforming the way they manage their unstructured data management utilizing the joint solution. Today's data management encompasses features that help organizations better understand their data, its purpose, its location, and more. As data management becomes more sophisticated, additional capabilities are being introduced. Advances in storage systems, data protection, secondary storage, and database management platforms give IT organizations with data management challenges a plethora of solutions to choose from. Join Komprise and the Western Digital ActiveScale team to learn about the data management solutions available to your organization and discover how these solutions can solve your data management challenges. - Discover how we can help you wrangle your data and help your company save time and money while eliminating your data management headaches! - See a live demo of the solution in action! - Identified and archived years of cold data to enable the move to an all-flash array. In this session of Mo Knows, he will cover the fact that data growth is exploding, and you are being asked to address growing capacity needs within tight budgets that are remaining flat. Mo will show you how you can achieve modern data management that can keep up with the explosion of data growth, while your budgets remain flat. Most importantly, achieving this without disruption to the users. The sheer volume of data produced today is staggering, doubling approximately every two years. But this is nothing compared to how data is set to grow over the next decade. Traditional approaches to managing your organizations' data struggle to keep up with today's scale and will prove to be entirely inadequate over the next few years. Can your current environment support this surging data? How will you manage this growth – while keeping cost-effective and meeting your business SLAs? Are you prepared? Join Komprise and Cloudian to learn about the latest for this informative webinar. We will discuss data management and protection strategies that your organization can implement today to enable your organization to scale with tomorrow's exponential data growth. Migrating NAS file data can be a nightmare. Join VP of Engineering, Mohit Dhawan, as he walks through how Komprise eliminates the errors and the guesswork by automating the migration with a reliable solution that is resilient and handles network and storage glitches. Data is growing fast, but IT budgets are staying flat. Join CANCOM, Qumulo, and Komprise for an informational webinar to learn how you can seamlessly cut NAS costs with a joint Qumulo and Komprise solution. Join Kumar Goswami, CEO of Komprise, as he walks through the elements of a modern approach to data management as well as how traditional data management, backup, and recovery solutions just don't scale to meet the needs of today's multi-petabyte environments. How do you gracefully move file data from your current storage to the cloud without any headaches or downtime for your users and applications? How can you go beyond just copying data to the cloud to preserving full file-based access to data in S3? Data growth is exploding, and you are being asked to address growing capacity needs within tight budgets. In this webinar, we will cover the top 3 roadblocks we repeatedly hear from customers in managing capacity growth efficiently – and, how to overcome them. Genome analysis is changing the world. Pacific Biosciences (PacBio) produces genomic sequencers that are used in wide-ranging ways: from diagnosing and treating diseases such as cancer and Parkinson’s to wildlife conservation and efforts to improve the world’s food supply. PacBio is accelerating the pace of genomic discovery with a data fabric enabled by NetApp and Komprise. Join Carl Siva and Krishna Subramanian as they share data management challenges faced in Electronic Design/Engineering and how Komprise helped Cadence understand and manage its NAS data. 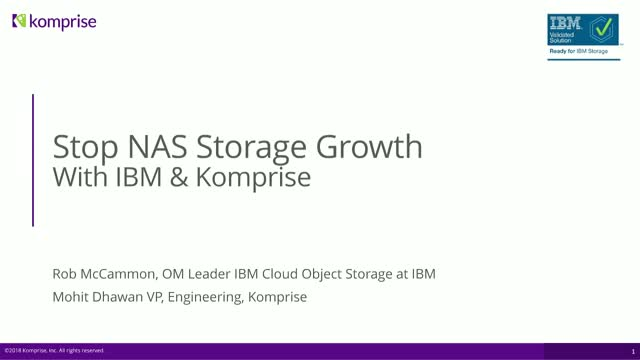 Komprise enables organizations, like yours, to efficiently manage data growth across storage silos. Komprise identifies hot and cold data, transparently moves data across multi-vendor storage, and delivers ongoing policy-based archiving and data migration.